I’ve enjoyed a lot of comics written by Greg Rucka, but I have to admit that I haven’t read one in a while. His Whiteout and Queen and Country books for Oni were very good, and I’ve liked some of the super-hero stuff he’s done for Marvel and DC. I thought he did particularly well with stories set in DC’s noir-ish Gotham City, as those comics always had an interesting texture and sense of place. So it’s nice to have the chance to read a comic written by Rucka that has that same feel without the word “crisis” in the title. 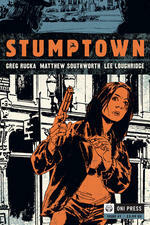 It’s Stumptown (back at Oni), a detective yarn set in the Pacific Northwest, and it gets off to a very promising start. It’s got one of those gender-neutral protagonists, a female private investigator with a lot of qualities that could stereotypically be tagged as male, but there’s no reason they should be. Women can certainly gamble too much and have smart mouths that get them in trouble. Rucka is particularly good at writing this kind of character; they may lack social graces and be prone to excesses, but they’re crafty and determined. They’re solution-oriented, or at least “end the problem” oriented. Our heroine here gets hired to find a casino owner’s granddaughter. She’s not getting paid, but success will erase her hefty gambling debt (until she builds it up again, one assumes). She’s not the only person on the girl’s trail, and while her rivals are a bit out of sleuth story central casting, Rucka writes them with assurance and some wit. His background in detective prose shows here. He can play with familiar elements and even trot out some hoary contrivances and get away with it, because he knows how to use them. He’s not satirizing or revitalizing P.I. drama; he’s just writing it very well. He’s helped by the gritty, shadowy but still restrained illustrations by Matthew Southworth, who seems very in synch with the kind of mood Rucka is trying to convey. Characters look right for their milieu, and the settings are evocative. Colors by Lee Loughridge are just right; they really help convey the passage of time in the protagonist’s difficult, complicated day. Rucka’s Whiteout collaborator, illustrator Steve Lieber, is doing terrific work on another genre story in pamphlet form, Underground (Image), written by Jeff Parker. It’s a survival adventure set in a not-quite-mammoth cave in the Appalachians starring a gutsy park ranger trying to protect natural spaces from greedy developers. Three issues are available so far, and it’s a lot of fun. You are currently browsing the The Manga Curmudgeon blog archives for the day Thursday, December 3rd, 2009.